Honor Cords that can Represent the "First, Finest, Forever." Graduation cords are the perfect way to reward any young woman for her participation in a school sorority during her time in college. Royal blue and white braided cords, or double-tied cords in blue and white, are especially fitting, as these are the colors of the first secret society founded for college women. Alpha Delta Pi does not offer honor cords through their website, but that doesn't mean you can't celebrate membership in a sorority in your own way. Any sorority sister would be proud to don a blue and white graduation cord for her commencement ceremony. It is easy to purchase Honor Cords from Honors Graduation. Simply click on the link and follow the steps. If you want a braided cord of Royal Blue and White then you will want to make sure single is selected and choose Royal Blue with White from the dropdown menu as your desired color. Another option, even with the braided cord, if you want to be wearing two cords is to do the double cord where both are Royal Blue and White Braided cords. This would be done by selecting the double cord button, then Royal Blue w/ White for both of your graduation cord colors. Alpha Delta Pi Chapters may want to opt for the double tied cord, where one is royal or light blue and the other honor cord is white. This is also a very nice look, sure to get positive attention for your Sorority. Click on the double as your style, then do either royal blue or light blue as your first color from the drop down menu, and white as the second color option. You can then order as many as you like. 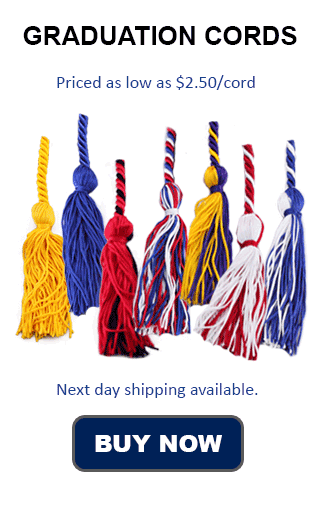 We give bulk discounts on Graduation Cord orders of 5 or more, 25 or more, 100 or more and for 500 or more on orders for blue and white honor cords. We accept all major credit cards. Contact us if you are wanting to pay with a check and we should be able to work something out. We also have cords for high school sororities.